For years, convenience operators have felt relatively insulated from the encroaching threat of online competitors. But a newly identified e-commerce phenomenon that’s casting a foreboding shadow over grocery stores should make the industry sit up and take notice. They’re called “basket bandits,” and they use a mouse instead of a gun to rob your register of sales. Bill Bishop, chief architect of Barrington, Ill.-based Brick Meets Click, coined the term earlier this year after identifying a growing trend in the marketplace. He defines basket bandits as online retailers that sell some of the merchandise commonly carried in a full-line multichannel supermarket (which Brick Meets Click defines as traditional one-stop-shop supermarkets with both online and physical presences). These bandits, such as Amazon, Costco.com, Drugstore.com, Blue Apron, Thrive Market, Beautybar.com, Hello Fresh and Dollar Shave Club, have successfully nabbed small wedges of the grocery business pie. 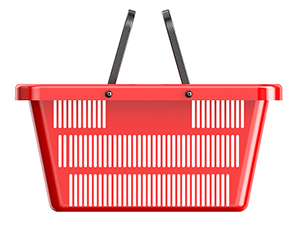 “If the online site offers everything that a full-line supermarket would, we would call it direct competition. But if it’s a subset of the competition, we call it a basket bandit,” says Bishop. Together, basket bandits command a whopping 84% of all online grocery trips today, vs.10% for multichannel supermarkets, according to Brick Meets Click. “While no single basket bandit is having a significant impact on most grocers, when you combine their efforts together, they can certainly have a significant impact,” says Bishop. The top bandito banana is, of course, Amazon, which caters to customer need states using various branded platforms, including Amazon Prime, Prime Now, Subscribe & Save, AmazonFresh, Prime Pantry, Amazon Family and Amazon Dash Buttons. Altogether, Amazon sites attract nearly half (48%) of all online grocery trips. Both grocers and mass merchants such as Target and Kmart are at the mercy of basket bandits, and Steven J. Montgomery, president of b2b Solutions LLC in Lake Forest, Ill., believes basket banditry is more than a passing fad. “I expect this to be an ongoing and permanent change as more and more consumers elect to use the internet for purchasing groceries,” Montgomery says. Experts expect this movement to have legs in large part because the retail grocery business continues to fragment; the availability of and demand for online options that offer easily searchable products will lead to further fragmentation, which weakens brick-and-mortar grocery market share. And that begs the question: Can the basket-bandit trend extend into the realm of convenience retailing? Ryan Razowsky, director of operations for Rmarts LLC in Deerfield, Ill., which operates five c-stores in the Chicagoland market, says yes. Bishop posits a similarly frightening scenario. The restaurant industry is already experiencing its own digital disruption in the form of third-party delivery systems such as DoorDash, GrubHub and Uber. But because most of these companies simply deliver the goods, it has yielded more opportunities than threats for traditional brick-and-mortar restaurants. Bishop offers the same advice to c-stores: If you can’t beat ’em, join ’em. “A convenience store focusing on its foodservice offerings should establish strong relationships with one or more delivery services so they can become a caterer. And they need to make it easier for people to order online and choose from an interactive menu,” he says. Better to join forces with an external delivery company then handle courier matters in-house, Montgomery says. Razowsky believes the on-demand delivery trend motivating basket bandits is being fueled by younger generations, whose disruptive preferences need to be taken seriously. “Millennials are more motivated by convenience and less by price. Many of them would rather have something delivered at a higher cost than wait in line inside of a c-store,” he says. Exerting digital influence via apps, websites and GPS/online locator maps is one strategy Bishop strongly suggests, as is leveraging digital communications on gas pumps to cross-promote sales inside the store. Another way to neutralize the competitive menace posed by basket bandits is to partner with them. Consider adding lockers to your store where patrons can pick up packages delivered by UPS, FedEx, Wal-Mart and/or Amazon, as many 7-Eleven stores have done. “There is a role in the distribution and fulfillment of basket-bandit products that the convenience-store retailer can play. Adding lockers creates a trip generator, a revenue generator and a way to have a place in this more contemporary form of shopping,” says Bishop. Basket bandits may be today’s big, scary threat, but Bishop advises retailers to be prepared for more disruption. One such hurdle—which basket bandits exacerbate—could be fewer trips to the pump. “C-stores are going to have to deal with the possibility of fuel purchases declining due to better gasoline mileage in cars, fewer cars using gasoline as a fuel source, and more of Uber and other services providing transportation alternatives,” says Montgomery. The moral of the story? Be prepared to flex and adapt quickly, Bishop says.